Together with the Thames skiff, the gig continues to be a very popular recreational rowing boat on non-tidal waters of the Thames and elsewhere. 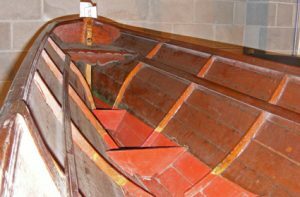 While similar to the skiff in shape of hull, the essential differences between Thames skiffs and gigs is that the former have a long curving stem and the tholes, gates, or rowlocks are carried on a saxboard (the uppermost strake). A gig has a straight stem and tholes, or rowlocks mounted on the gunnel. The Museum’s example is believed to have been built about 1900.